You've added Jeronimos Monastery, Bairro Alto, Padrao dos Descobrimentos, and other attractions to your itinerary. On the 23rd (Tue), admire the landmark architecture of Jeronimos Monastery, wander the streets of Belém Tower, then pause for some photo ops at Padrao dos Descobrimentos, and finally wander the streets of Bairro Alto. For traveler tips, more things to do, other places to visit, and tourist information, you can read our Lisbon trip itinerary builder website . Vitoria, Brazil to Lisbon is an approximately 14.5-hour flight. The time zone changes from Brasilia Time to Western European Time, which is usually a 3 hour difference. Expect much colder temperatures when traveling from Vitoria in March; daily highs in Lisbon reach 20°C and lows reach 10°C. On the 24th (Wed), you'll have the morning to explore before heading off to Sintra. You've added Centro Historico de Sintra, Park and National Palace of Pena, Castelo dos Mouros, and other attractions to your itinerary. On the 24th (Wed), steep yourself in history at Castelo dos Mouros, explore the historical opulence of Park and National Palace of Pena, then get to know the fascinating history of Centro Historico de Sintra, and finally admire the natural beauty at Quinta da Regaleira. To find photos, other places to visit, ratings, and other tourist information, refer to the Sintra tour planning tool . Sintra is very close to Lisbon. In March, plan for daily highs up to 21°C, and evening lows to 10°C. Wrap up your sightseeing on the 24th (Wed) to allow time to drive to Lisbon. Your day-by-day itinerary now includes Pavilhao do Conhecimento- Ciencia Viva, Lisbon Oceanarium, Telecabine Lisboa, and other attractions you added. On the 25th (Thu), you'll have a packed day of sightseeing: make a trip to Praca do Comercio (Terreiro do Paco), take in the architecture and atmosphere at Igreja de Nossa Senhora da Conceicao Velha, take in the spiritual surroundings of Se de Lisboa ( Igreja de Santa Maria Maior ), get to know the fascinating history of Miradouro de Santa Luzia, then step into the grandiose world of Castelo de S. Jorge, and finally stop by Praca da Figueira. 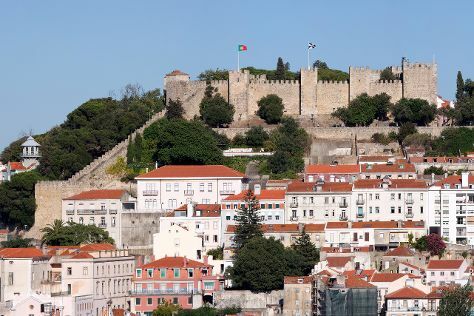 To find ratings and more tourist information, use the Lisbon online sightseeing planner . Lisbon is just a short distance from Sintra. Finish your sightseeing early on the 26th (Fri) to allow enough time to travel to Madrid. Your day-by-day itinerary now includes Retiro Park, Gran Via, Torre de Madrid, and other attractions you added. To find ratings, traveler tips, where to stay, and tourist information, use the Madrid trip itinerary planning website . Traveling by flight from Lisbon to Madrid takes 4.5 hours. Alternatively, you can drive; or take a bus. The time zone difference when traveling from Lisbon to Madrid is 1 hour. In March, Madrid is slightly colder than Lisbon - with highs of 17°C and lows of 5°C. On the 30th (Tue), you'll travel back home.